Traditional mopeds are a part of motorcycle culture that is fast disappearing, rendered obsolete by changing laws and now kept alive mainly by the hard work of dedicated fans. 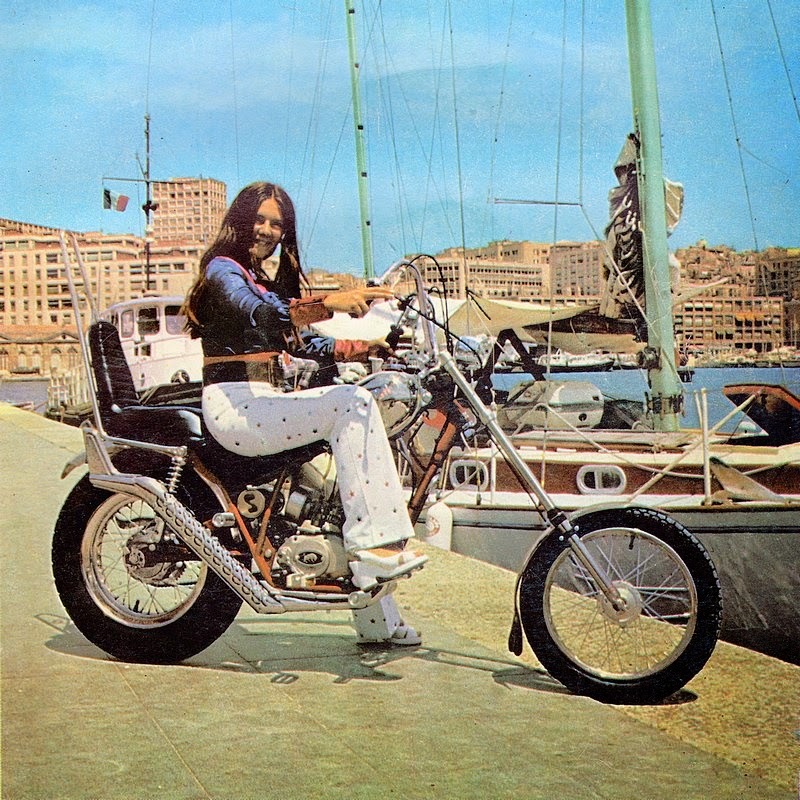 The term ‘moped’ is now often used interchangeably with sub-50cc scooters, but the true original mopeds and scooters were quite different things all together. Bikesure takes a look at the past, present and future of the red-headed stepchild of the motorcycle family tree. In many ways the moped is a throwback to the very earliest days of motorcycles. Once Victorian engineers stopped trying to add steam motors to penny farthings or wooden bicycles, attaching motors to the newly developed “safety bicycle” was the vital evolutionary step that started the rapid development of motorcycles as we know them now. As engines became more powerful they required new, stronger frames to stop them tearing themselves apart, but there is always room for a cheaper alternative and motorised bicycles began to step into that niche. While they weren’t as attention-grabbing as their more powerful siblings, motorised bicycles were quietly evolving throughout the first half of the 20th century. The name ‘moped’ wasn’t invented until the 1950s, before when they were known by a variety of names including cyclemotors, autocycles and Wilfreds, named after the popular comic strip Pip, Squeak & Wilfred. Anyone with an interest in the history of motorcycles knows that their popularity increased massively after the Second World War. As Europe began to rebuild, people wanted cheap, reliable forms of transport. Motorcycles were cheaper than cars, and scooters cheaper than motorcycles, but nothing could beat a Wilfred in terms of price and fuel efficiency. Across the continent manufacturers began producing a new generation of small motors designed to be fitted to bicycles. Italy had the Mosquito, Germany the Hilfsmotor and France had the Velosolex. 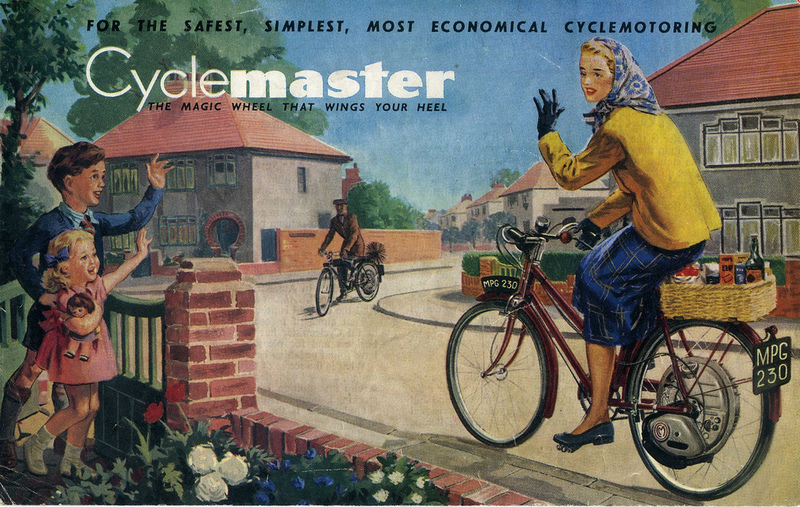 Here in the UK we had the Cyclemaster, a self-contained engine built into the hub of a wheel that could be installed on the frame of any bicycle. Its flexibility made it an instant hit when it was launched in 1950, and it had racked up 100,000 sales by 1952. 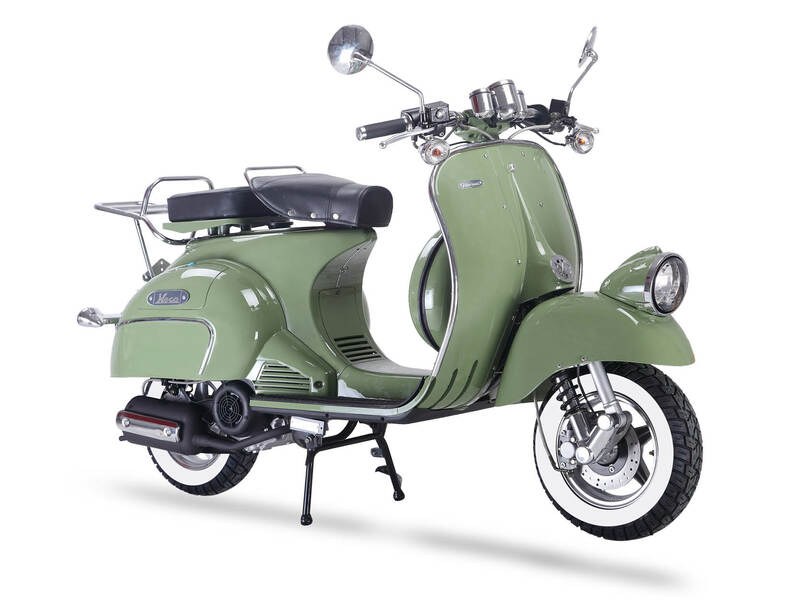 As the 1950s went on and post-war austerity began to recede, the market for these kinds of motors began to decline, more people were able to afford cars, motorcycles and what were increasingly becoming known as mopeds (a compound of motorbike and pedals). 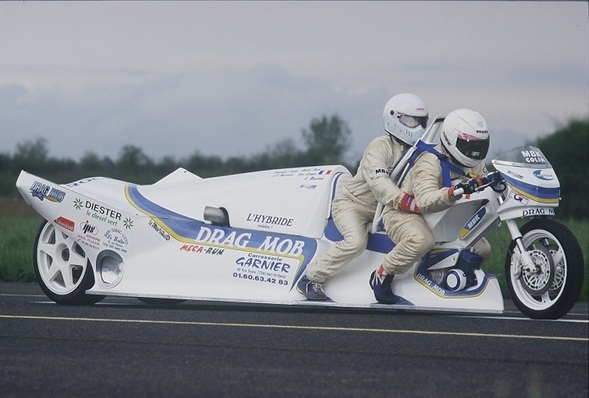 These weren’t the sexiest machines, but they were a great method of transport for people who did not feel the need for speed. The law at the time allowed 16-year-olds to ride bikes up to 250cc as long as there were learner plates on the bike. It was the government’s attempt to close this loophole that helped to make mopeds cool. In 1971 Ted Heath’s government passed new laws limiting 16-year-olds to bikes with a 50cc engine until they were 17. The logic behind the move was that it would limit these first-time bikers to sedate step-through mopeds and thus quell the fires of youth that burn within them, forever threatening to destroy society if stoked by uncontrolled acceleration. Or at the very least, save a few lives. What the government didn’t anticipate was manufacturers reacting to this loss of a dependable income stream by introducing a new breed of moped, essentially cut down but highly tuned motorcycles with added pedals, allowing them to conform to the letter of the law, if blithely ignoring its spirit. These bikes became known as “Sixteener Specials”. The most popular of these sports mopeds was the Yamaha FS1-E, known as the Fizzy to its legions of fans. Launched in 1973 at the height of the glam rock era, it was originally available in one colour only, candy gold. Seventies kids might recognise this as the same colour as orange Spangles. While the colour was undoubtedly on-message, it was the engine that really sold it to the nation’s teenagers. Equipped with a 49cc single cylinder, 2-stroke engine it was capable of nudging 50mph at top speed. It was also relatively easy to mod to give it an extra 10mph to play with (obviously this was terribly illegal and nobody ever did it, cough cough). The Fizzy was an instant hit, and remains one of the most fondly remembered bikes of the era. These days a healthy ecosystem of Facebook groups, forums and owners clubs lets fans and owners reminisce or trade spare parts as well as providing help and encouragement with restorations and repairs. Unless you had the rare foresight to hang on to your fizzy back in the day you’ll be looking at throwing down up to £5,000 for a fully restored machine. You may well be able to pick up a bargain – though even some barn finds fetch £2,000 – but that’ll obviously require a lot of work. After all, these were generally thrashed roundly for about a year before being sold on to another 16-year-old – not the kind of life story that results in a well looked after machine! It’s not a cheap hobby, but those words could be the motto of most motorcycling. The Fizzy showed other manufacturers the way forward and before long other sporty mopeds were vying for the attention of the nation’s teenagers. Readers of our guide to iconic 1970s mopeds will recall similarly revered classics like the Suzuki AP50 and the Honda SS50. The fact that it was newer Japanese manufacturers dominating this new market reflected the geographical transformation of the motorcycling world at the time, but there were plenty of European manufacturers vying for attention too. Manufacturers like Gilera, Garelli, Puch, KTM and Fantic all had bikes capable of provoking misty-eyed reminiscences from people who owned them. For example, the Garelli Tiger Cross would give you 60mph with almost no effort, a full 10mph faster than an unmodified fizzy. 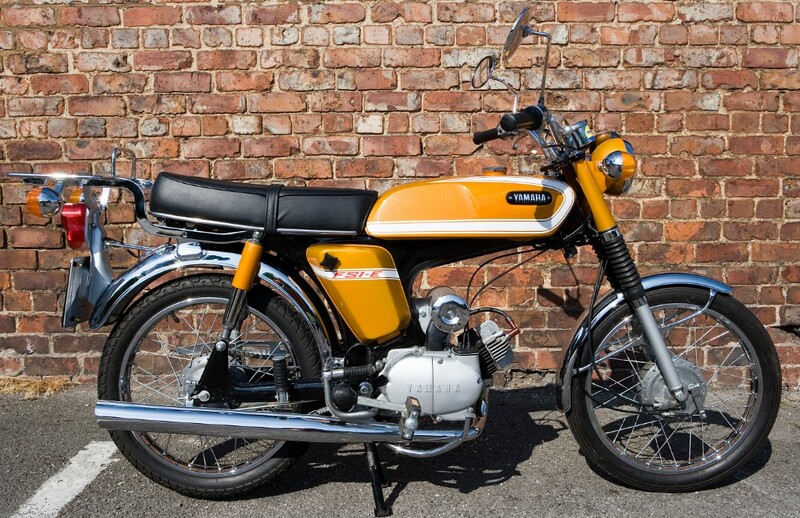 Other machines, like the KTM GT50 or the Puch Grand Prix, may not have been able to match the speeds, but they met the other main requirement for 70s mopeds – they looked cool. 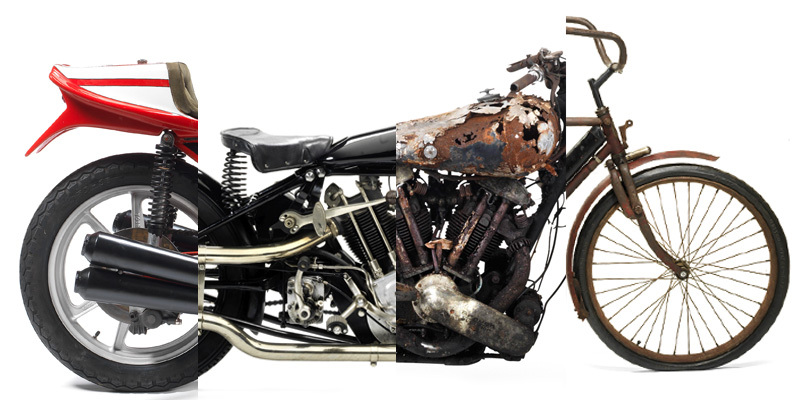 In many ways, how cool your bike made you look was as important as how quickly it got you about. 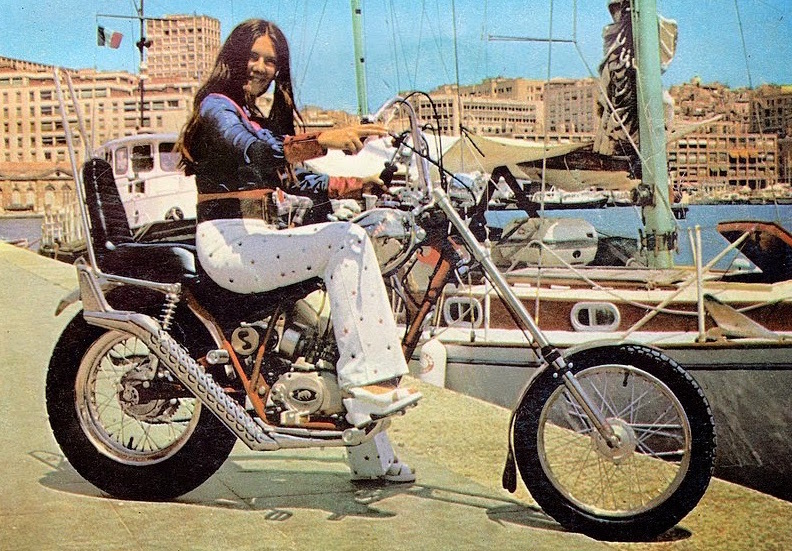 By this metric the best bike was the Fantic Chopper. Gigantic extended front forks and a high back seat lent their owners a touch of Californian cool, making it an excellent lounging prop with a six-speed gearbox and surprisingly good mileage. By the time Jasper Carrott hit the top 5 with Funky Moped (produced by ELO’s Jeff Lynne, fact fans!) Britain – or at least the pubescent male part of Britain – was well and truly in the grip of moped fever, with the trademark jar-of-wasps engine sound reverberating down the streets and lanes of the country. It was a golden age, but like most golden ages it couldn’t last indefinitely. 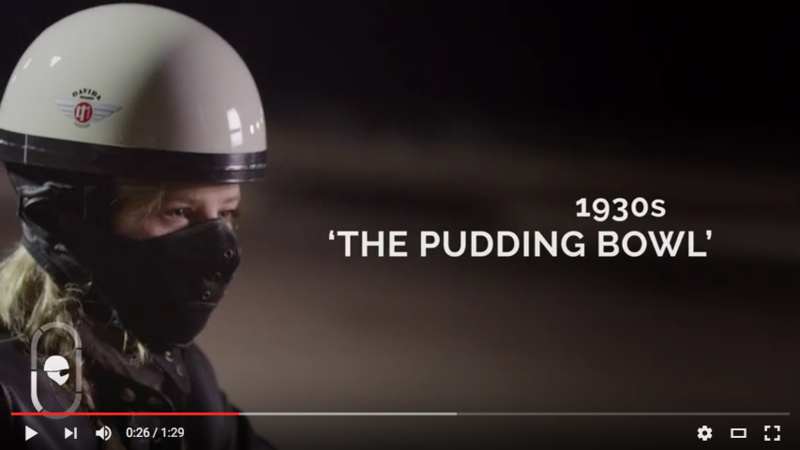 Despite manufacturers sticking to the letter of the law, getting the nation’s kids onto cool, zippy mopeds hadn’t been the government’s intention when they changed the law. So in 1977 they changed it again, introducing legislation that restricted 50cc motorcycles to a maximum speed of 30mph, but removed the requirement for pedals. Given that these had been, at best, a method of kick-starting sports mopeds this was hardly the greatest loss, but by neutering these scaled-down sports bikes it precipitated the beginning of the end for the true moped (even though many teens still found ways to illegally derestrict their bikes…). Obviously they didn’t disappear overnight. Teenage boys weren’t the only market for mopeds and, even at the height of Mopedmania, there was a market for less speedy runabouts and this didn’t change when the law did. It was, however, shrinking steadily. If there’s no performance difference between a sporty-looking moped and a scooter then there’s no particular reason to keep both on the market, and manufacturers slowly began turning their attentions to modern scooter-style bikes you see today. The law was changed again in 2003, adding further definitions to what a moped is and restricting what they could do even more. As it stands now, a moped cannot have an engine more powerful than 49cc and must not be able to go faster than 28mph. So where does that leave mopeds and their fans in the 21st century? Well, technically in rude health: there are plenty of 50cc moped scooters available, although design-wise they are closer to the classic scooter than yer actual purestrain moped. In fact, one of the few companies still producing a vehicle with the classic “step-through” shape is Tomos, with their Classic XL45. This essentially means that anybody wanting to get a moped, a true moped, has to go second hand. If you don’t mind getting your hands dirty there are plenty of bargains out there waiting to be rescued and repaired. Spare parts are more available for some brands than others, but there are small bands of enthusiasts keeping the flame, and supplies of rare components, alive for pretty much any bike you care to name. Facebook is a good place to connect, swap tips and trade with fellow owners. Once you’ve got your moped working you need to navigate the confusing and time-consuming process of getting it registered, which you’ll need to do if it’s been off the road since before 1983. 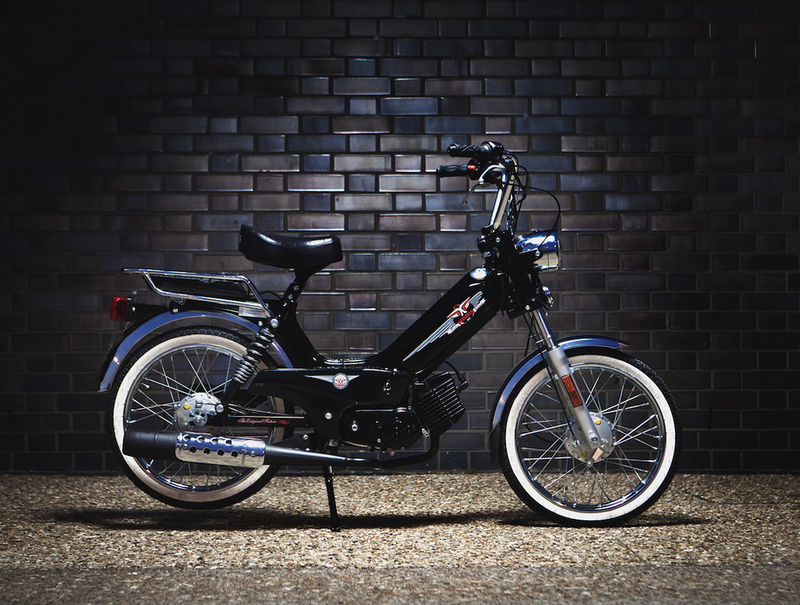 So, you’ve got a moped… what now? Recent years have seen the emergence of the “alt bikers” – a new wave of custom bike builders taking a “future retro” approach to their work. 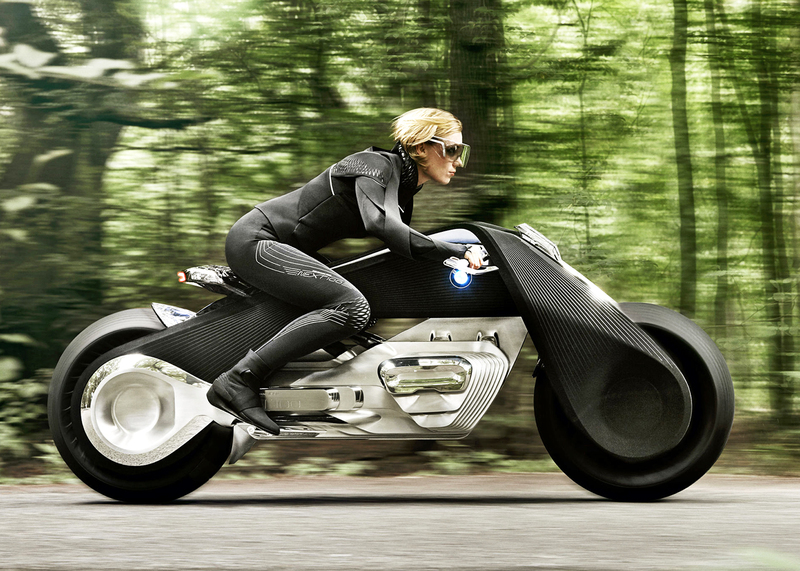 Mopeds have been swept up in this, and there are countless examples of exceedingly cool custom jobs being made. Anyone seeking inspiration should look at Garage, which claims to be the first (and let’s face it, only) social network for moped customisers. There are plenty of clubs you can join which organise the usual motorcycle club activities, as well as events like the Nifty Fifty or the Mopedathon. But does this mean the future of mopeds is to be a niche interest for an aging band of enthusiasts? 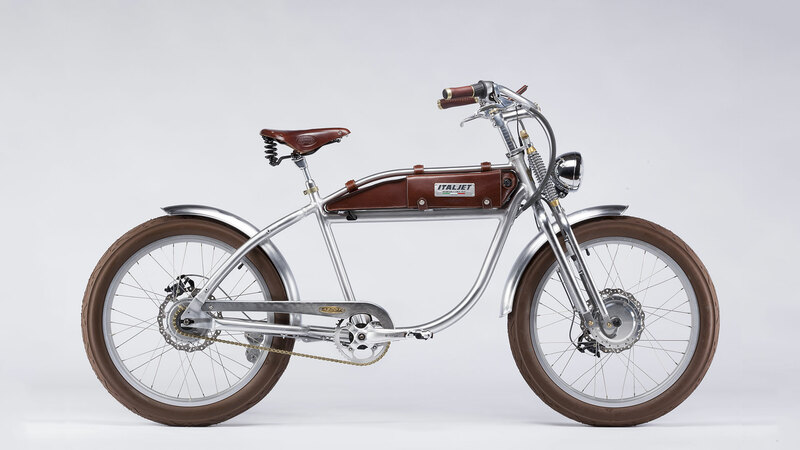 The dream of cheap, fuel-efficient transport is still alive, and indeed many of the manufacturers of old are still around, albeit concentrating on electric bikes for the most part. In many ways history has come full circle, with manufacturers like Puch and Italjet returning to their roots. Electric bicycles may not become the next big thing in cheap personal transportation until battery life improves and costs fall, but even the biggest proponent of internal combustion would have their head turned by something as stylish as the Italjet Ascot. If pedalling at all is too much like hard work, new designs like the Motorman also hit the future-retro mark, with less danger of accidentally exercising. But what if you still feel the need, the need for speed? If you’ve got understanding neighbours or easy access to a long private road you could try fitting a jet engine to your moped. Obviously this could be insanely dangerous, but luckily there are people selling pulse-jet engines, designed for bicycles which if nothing else saves on R&D time. So is now the time to get back on the saddle of moped fandom? 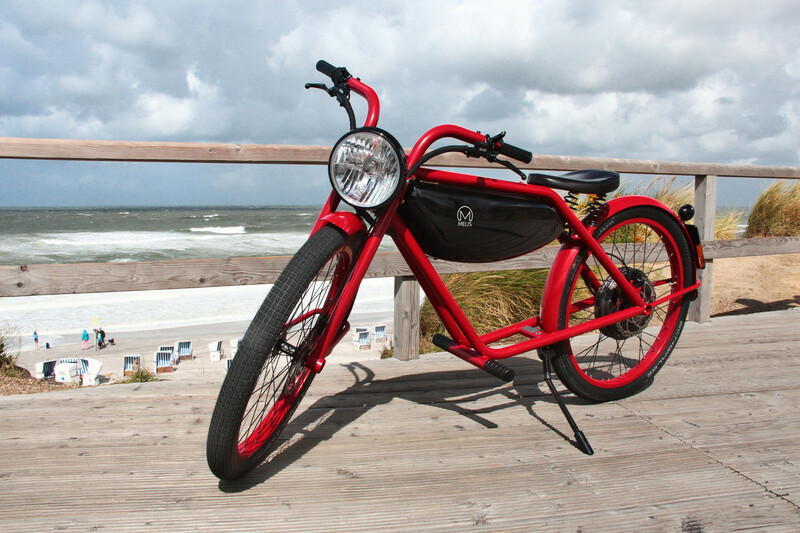 While it hasn’t quite reached these shores yet, there are signs that old school mopeds are undergoing a bit of a revival in the United States. Act now, so you can still claim that you were into them before it was cool. What are we saying, they’ve always been cool!